A load of “boat people” sailed up the Brisbane River on Sunday. It was a hi-tech solar ship with a crew of Europeans on a mission to prove that an entirely solar-powered ship can sail around the world. As the futuristic, flat topped, bat-winged marine wonder silently and efficiently sliced up the Brisbane river against the current it looked more like a scene from “Star Wars” than “Sea Patrol”. 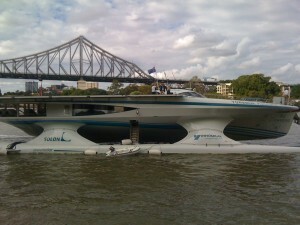 Brisbanites gathered along the river walk stopped and stared in wonder at the 31 meter hi-tech Turanor PlanetSolar as it went up the river effortlessly. Was this how the original Australians watched the first European boat people sail up the Brisbane River in a similar sized ship about 187 years ago, propelled not by the sun but by billowing white sails? As then, this ship looked like it came from another world. The Story Bridge built in 1940 made a great backdrop for photographers, symbolising the contrast between old and new as the solar ship docked silently next to the Riverside restaurants and ferry terminal. Despite having just battled 40 knot winds for days and probably not slept much the amiable 39-year-old Swiss project founder Raphael Domjan talked patiently with the assembled media with goodwill about the round-the-world challenge. “The expedition will prove current renewable energy technologies are reliable and effective, and will help to advance scientific research into the production and storage of solar energy,” Mr Domjan said. Minister for Energy and Water Utilities Stephen Robertson welcomed the ship to Queensland and posed for the photo shoots with the crew, boasting that Queensland’s government was “doing all things solar”. This innovative private enterprise investment in energy research may have been spurred on by the European emission trading scheme which has been operating for six years. The PlanetSolar Project ship has been primarily funded by German entrepreneur Immo Stroeher, 65, who was a board member of beauty and hair products multinational Wella AG and is a grandfather of five. Mr Stroeher, who has been investing in various solar energy projects for 10 years, has worked on this marine solar energy project since 2008. 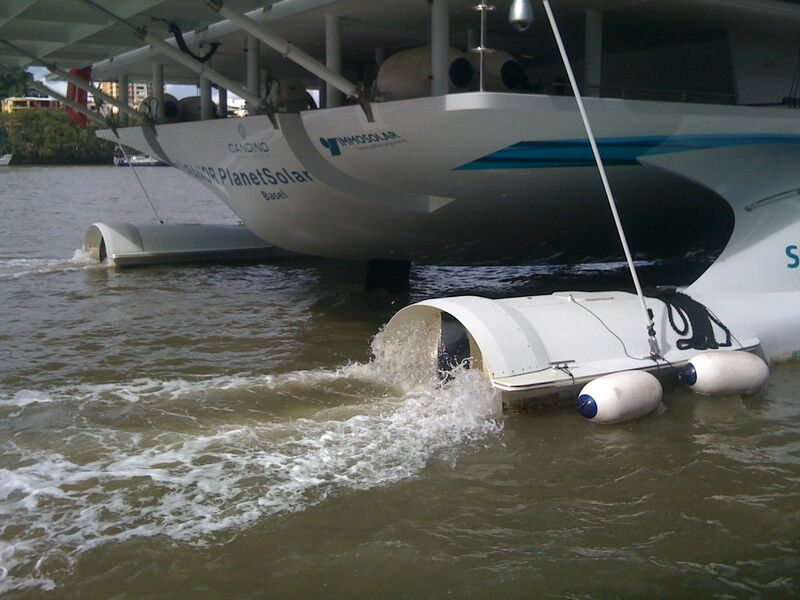 “We want to show that motorized shipping can function without fuel,” he said. Back in 2001 Raphael Domjan along with a brother and a friend set up Horus Networks which currently boasts the world’s only solar powered computer server. He then joined the Planet Solar project. “I hope we can show we have the technology, I hope we will have enough good spirit to protect the planet, so we can live like we always have,” he said as he took us on a tour of the hi tech bridge that looks like the cockpit of the latest stealth bomber. “Computer technology controls the power sources,” said the former rescue pilot, mechanical engineering graduate and founder of Swissrescue. The vessel is covered in more than half a square kilometer of solar panels. Wings of more panels roll out on marine travelers at sea. Its wave-piercing hull design was designed by a New Zealander and was tank tested in Hobart to be efficient through the water. 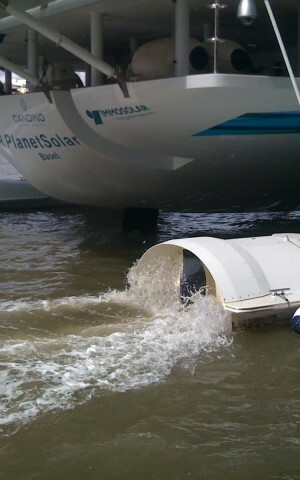 The key to the practicality of this vessel are the huge hi-tech German batteries that make the project possible. If the vessel is confronted by over 40-50 knots it cannot go straight into the wind as it has about 140 hp at its disposal. But the sailing master has computer technology to try to plan to avoid bad weather where possible and stay in the sun on a long ocean voyage. “The only small problems along the way have been normal marine issues,” Mr Domjan said. He said one product of the research were the strange half submerged propellers “which are 30 percent more efficient than submerged ones”. At riverside until June 2 the solar ship will head north to Cairns for routine cleaning and maintenance, then to Hong Kong, Shanghai, Singapore, Mumbai and Abu Dhabi finally completing the 50,000 mile journey in Monaco where it started seven months ago. So far the journey has taken the crew from Monaco to Miami, Cancun through the Panama Canel, then Noumea to Brisbane. On the way the project has already broken records for the fastest crossing of the Atlantic Ocean as well as the longest voyage by a solar vessel.